We want to thank you for keeping tabs on the project through the years. We believe it's time to let you know the ugly truth for the year of silence. Patriots has been put on an indefinite hold. The game we wanted to bring you was just too big for a volunteer project. Many, many talented people lent their time and hard work for this project. Some left for financial issues, some left because they were called up to the big show and some just left. We felt that we were either going to bring you the game that it deserved to be or none at all. A project of this magnitude requires funding and we just couldn't do it. The fact is, without the plan that we had in place, a Kickstarter campaign wouldn't have worked. Here's the deal, we were going to create a 1 map, 1 gamemode multiplayer "Beta" for people to try and then launch the Kickstarter. Patriots required so much in the coding and animation area that it was just too much. Too many people coming and going there was no stability. Now, Molotov isn't dead. All the work for Patriots is under lock and key and it won't be going anywhere because we still have plans to do it. Just... not for a while. Out of the wreckage, a team of 5 stepped up (including the lead artist, concept artist and yes, Andrew our composer) to create a smaller and simpler title. It is a completely opposite genre than Patriots but, much more attainable for us. And we're actually past the halfway mark on the completion timeline! This little game is quite addicting. We're not ready to announce it yet but, this one is coming and we will announce it on this page. So, this is the ugly truth. It's a hard thing for us as there was so much time and excitement for Patriots. One day we will be able to create that monster and we hope you'll be there to experience it. Thank you again for all the support over the years. It truly, truly means a lot. To Survive Is Freedom. What In The World Is Going On, Molotov!? Let Patriots invade your desktop with this Max Slade wallpaper! Let Patriots invade your desktop with this Jason Walker Wallpaper! Let Patriots invade your desktop with this Liz Freeman Wallpaper! This project looks very very promissing ! Definitely tracking ! Mind telling us what type of game is this ? FPS or TPS ? First Person Action/Adventure. While there is some shooting involved it's not an FPS. so at this rate perhaps in about 3 or 4 years you will have some actual gameplay? and not just the usual pretty pictures and few 3d models that every game on indie DB has. just another drop in the pond, i bet anyone 100 quid this game never sees the light of day. Thanks for your comment even of the negative nature. We have addressed some of your concerns in our recent news update. We hope that it clears anything up involving your comments. Not at the moment. We're working on a few things and we'll update when ready. Thanks Satori4! Thanks for the track and we're glad you like our work! We Called Upon War is now available to listen to on Spotify! If you use Spotify make sure to add it into your playlists! 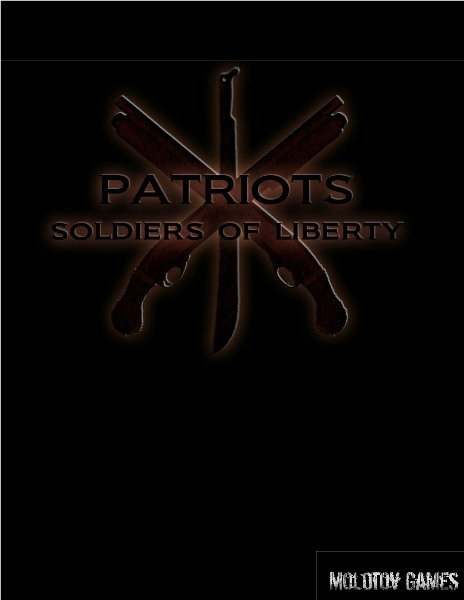 Many of you have asked for it, we've decided to respond: Patriotsthegame.com It's coming! With the focus of Patriots being Max and Liz, so shall our media sites! Facebook, Twitter and YouTube have been overhauled! Check them out! July 9th, we will be on GameFAQs Podcast to talk about Patriots! Search GameFAQs Podcast on iTunes. We will be revealing an exclusive too! Hey everyone, check out OnlySP here: Onlysp.com They have some good things going on over there! Vehq.net A recent interview with Game Director, Zak Spiro, on Patriots. Check it out!